In 1815, Ausano Ramazzotti, a herbal doctor, created in his shop in Milan, a tonic liqueur made from herbs and spices including gentian root, rhubard, cinnamon and the peel from Sicilian oranges. 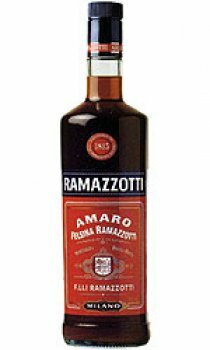 Today, Ramazzotti is still produced with the same ingredients and the same technique used by its inventor over 180 years ago. Made with 33 medicinal herbs and plant roots which give it a characteristic bouqurt, Ramazzotti is a sweet and strong liqueur, with an unmistakable orange flavour. It is not only a digestive but also a tonic and refreshing drink. In fact Ramazzotti today is no longer just an after-dinner drink but it is also a drunk as an aperitif.